Companies use social media to support customer service operations but it seems Emirates Airline is not one of them although the company adds its logo to t-shirts of Real Madrid football club players. An angry father posted his complaint to the official Facebook page of Emirates Airline highlighting how his unaccompanied son's flight from Germany to Dubai was a horrible experience with careless Emirates staff members. For example, none of Emirates Airline staff members were speaking the German language that his father added to the booking application itself. They were not paying attention to kids, or even speaking to them properly. 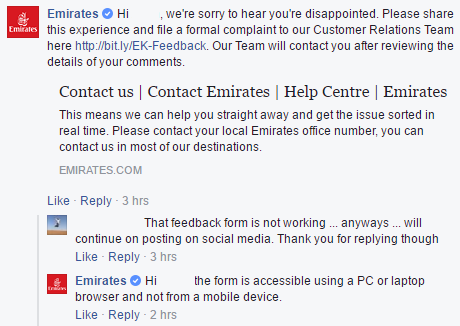 The official Facebook page of Emirates Airline company commented on the complaint by saying we are sorry and, asked the father to submit a formal complaint on a given link. The guy responded saying the link is not working. Surprisingly, Emirates Airline social media team responded to the father saying the link is only accessible using a PC or laptop not a mobile phone! According to StatCounter, mobile and tablet devices accounted for 51.3% of internet usage worldwide in October compared to 48.7% by the desktop. However, Emirates Airline is not caring if parents and travelers can't access their complaint form from their mobile devices while on the go. Emirates Airline is not even caring if those who search on Google can find their website as Google algorithms are considering mobile compatibility.